In addition to portables, fixed station, call boxes, and wireless intercoms, there are other MURS products available to meet a varety of requirements. For example, the Quick Assist (shown below at the left) is a push button battery powered call for assistance device. These devices are ideal for use in retail stores, schools, and offices. All a visitor has to do is push a button to transmit a voice message requesting assitance to personnel equipped with MURS portable or fixed station radios. Additional information is available by clicking here, or you can buy it on line by clicking here. 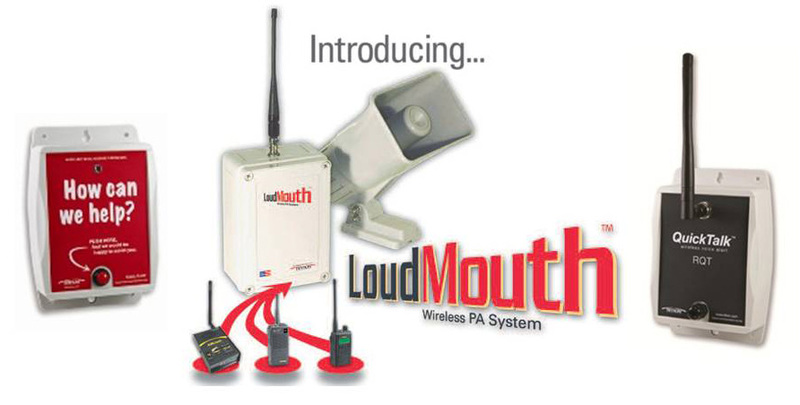 The LoudMouth wireless PA system is available in two versions. The unit shown below in the center is a completely self contained receiver, PA amplifier, and speaker that can be activated by any associated 2-way radio. A short video is available that will quickly explain how simply a wireless PA system can be set up. Click here to view the video. A brochure is available by clicking here and an interesting story of how this product is used is available by clicking here. You can purchase the LoudMouth on Amazon.com by clicking here. The LPA model (not shown) provides an interface into an existing wired PA system. This model is ideal for any location with amplifiers and speakers already installed. The LPA provides access to the PA system by any user with a radio set up to access the PA system. Additional information on the LPA is available by clicking here. You can purchase the LoudMouth LPA Version at our on-line store by clicking here. The Ritron QuickTalk (RQT), shown above on the right, is available in a more powerful version of the QuickAssist with the additional functionality of adding external sensors, either wired, wireless or both. In some applications, this unit can be equipped with a call button, external wireless call buttons as well as being used to monitor doors and/or equipment. A product data sheet is available by clicking here. For specific pricing information on the various configuration options, please call us at 205.854.2611, or drop us an email to sales@falcondirect.com.